About Lev Grossman (Author) : Lev Grossman is a published author. 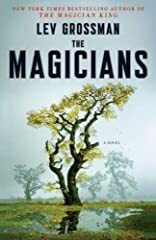 Published credits of Lev Grossman include The Magicians (Thorndike Reviewers' Choice). One of the most bitter fantasy novels i ever read and one of the most original despite looking like a total Harry Potter and Narnia rip-off. There is a reason for the book to look like that and you´ll be surprised. If you ever wondered how an adult version of Potter and Narnia would read like, this is the one to grab. It´s not a kids book, it´s very dark, very sad and extremely bitter about dreams and fantasy but it´s not a depressing book. Excelent ending and a real page-turner. One of the best fantasy novels i read in years.